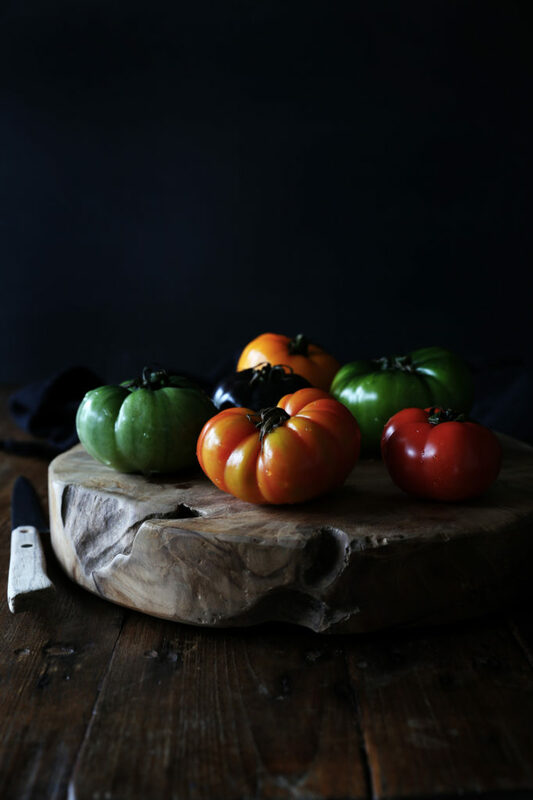 I saw these beautiful heirloom tomatoes at the grocers and was literally stopped in my tracks by their bright ombre colours and quirky shapes. Truth be told, I’d never bought heirloom tomatoes before but these were so irresistible I knew I had to find something to do with them. Aside from looking beautiful, tomatoes contain a heap of beneficial antioxidants such as vitamin C, beta-carotene, manganese, vitamin E and many phytonutrients (extremely beneficial nutrients only found in plants!). Antioxidants are so beneficial for our bodies because they boost the immune system, protect against free radical damage and degenerative diseases, and help slow the ageing process – win! Which is exactly what happened with these heirloom tomatoes. 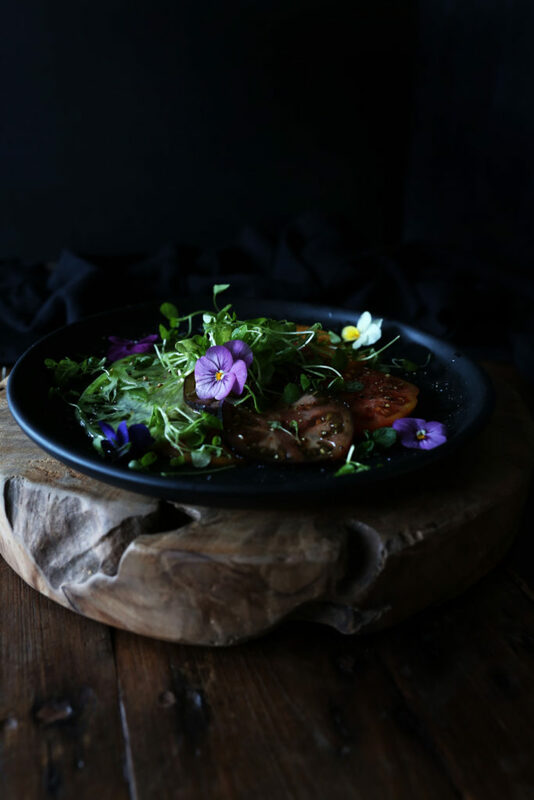 I created a simple sliced tomato salad with organic extra virgin olive oil, cracked salt and pepper, fresh micro greens and edible flowers. This is a classic example of beauty in simple. Even though this tomato salad is extremely easy to prepare, it’s vibrant colours and amazing flavours transform it into something quite impressive, perfect for that dinner party you forgot you had to take a plate to! 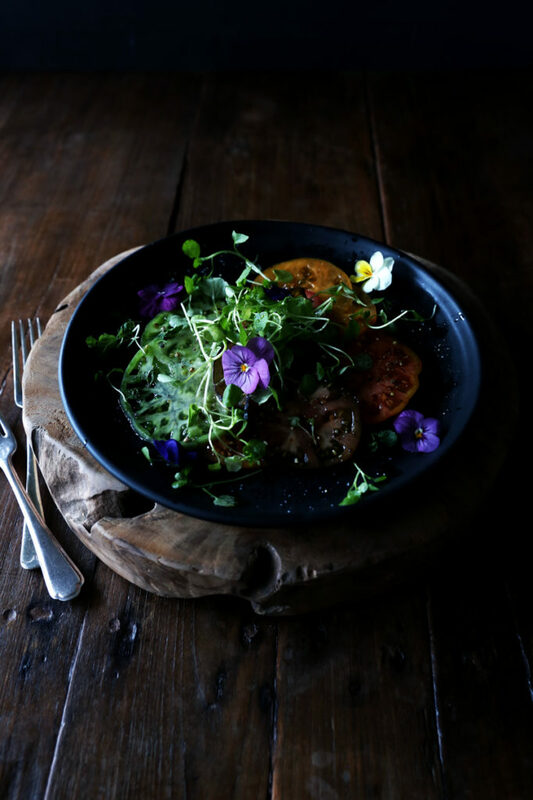 This heirloom tomato salad makes a great accompaniment to any meal or you could easily turn it into a main meal by simply adding a protein of your choice. I love it with these felafels (minus the wrap of course), or with coconut crusted white fish (simply dip fish in coconut flour and pan fry in coconut oil). I think it would also be great with a lovely soft cheese if that’s something you eat too. 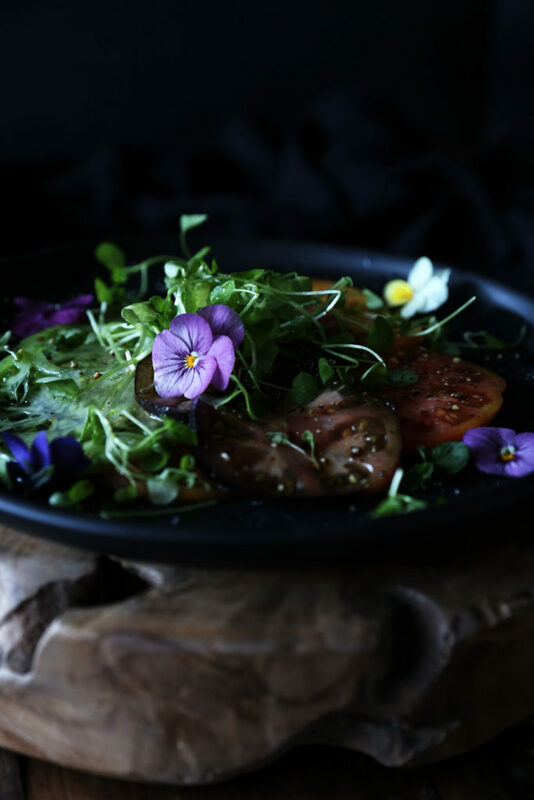 I hope this simple salad idea gives you some inspiration for your own salads this summer, and when you next see an amazing piece of fruit or vegetable that you don’t quite know what to do with, just remember, beauty in simple. Enjoy! Rinse the tomatoes under running water to ensure the skins are nice and clean. Turn the tomatoes on their sides and slice them into rounds. Arrange the tomato rounds on either individual plates or a large serving platter, in a circle in the centre with alternating colours. Sprinkle a drizzle of olive oil over the tomatoes followed by a generous grind of salt and pepper. Rinse the micro cress under running water and drain well. Arrange a generous handful on top of the tomatoes and sprinkle a little more olive oil over if desired. Finish by decorating with some colourful edible flowers.